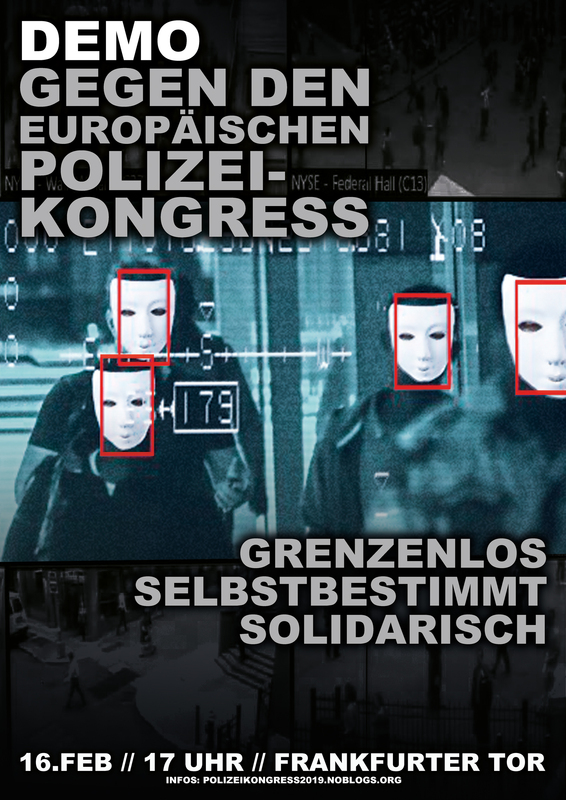 From 19 to 20 February, the 22nd European Police Congress will take place in Berlin, a discussion platform for representatives of the police and security authorities, as well as an industrial exhibition of the latest weapons and surveillance technologies. Originally published by Indymedia DE. Edited machine translantion by Enough 14. Year after year, this congress offers an opportunity to make the surveillance and prosecution of disagreeable political opponents* more effective and to standardize them throughout Europe. The theme of this year’s congress is “Security-Migration-Integration”. The protection of Europe’s external borders is to be stepped up, any support for refugees becomes a criminal offence and unadjusted people are to be assimilated with the stick. Another major theme of this year’s programme is the use of smart crime prevention, including intelligent video surveillance and artificial intelligence. Addressing this issue is essential if we are to remain resistant and rebellious. There is already great resistance to the new police laws and to mass surveillance. We want to build on this resistance with the demonstration and take the streets three days before the start of the congress, across the spectrum, loudly and determined. The demonstration should offer space for the communication of content and be a space of solidarity for the most diverse forms of action and expression. Therefore: The demonstration is what we all make of it! Don’t rely on people to organize what you like. If you want to fly around the demonstration for example, take it into your own hands. We don’t want flags or other symbols of parties at the demonstration, the same applies to their youth organizations. If there are attacks and arrests, we want to show solidarity. We leave no one behind. Pay attention to yourself and your environment. If you observe arrests or are affected yourself, contact the Berlin legal team (EA). You can reach the legal teamwill on phone number 030/69 22222 from the start of the demonstration and they will help you in case of an arrest, including the mediation of lawyers. Please don’t forget to call the EA again when you are released. Currently it can be assumed that there will be preliminary checks by cops before the demo starts. These have to be circumvented and/or refused collectively. Let’s demonstrate: Without borders, self-determined and solidary against the formation of the authoritarian and growing police state!